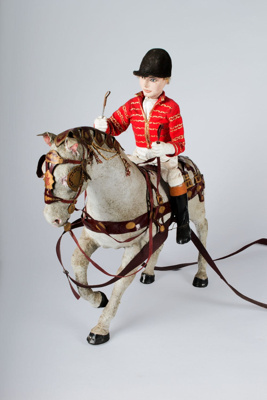 The model consists of: A highly ornamented gold coloured horse drawn coach. Decorated with 2 trumpet players attached at front corners, 2 winged archers at back. 8 white horses are harnessed in pairs with leather latticed saddles painted red and gold. 4 figures on horseback dressed in riding gear (Role named a 'Postilion'). 17 standing figures: 7 Walking Grooms (Men wearing knee length scarlet jackets with gold trim, white britches and black riding hat and boots), 6 'Queen's Footmen (Men wearing knee length scarlet jackets with gold trim, burgundy britches and black riding hat and shoes with white stockings)', 4 'Queen's Body Guards of the Yeomen of the Guard' (Wear knee length scarlet jackets that carry the badge of the yeomen, with a white frilled collar, scarlet stockings and black shoes with a flower on, Black full brimed hat with white/blue/red flowers decorating it, all carry a spear with red shaft, and gold 3 pointed tip aka a Wilkinson sword). The primary composition material appears to be painted plaster, with painted leather and cloth accessories and various metal attachments. This is a model replica of the Gold State Coach which was used during Queen Elizabeths Coronation.